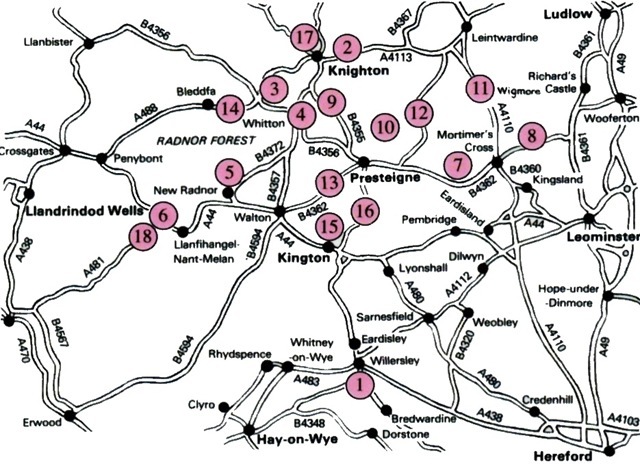 We are a very friendly Group, covering the Knighton and Presteigne area of Powys (though parts of both towns are in England! ), with members in Herefordshire also. We have the Offa's Dyke Centre in Knighton (the route passes through the town). Knighton is also the start of Glyndwr's Way and the new Heart of Wales Line Trail passes through our area also. We walk every Wednesday and alternate Saturdays, generally with Moderate walks 6-10 miles. We also do short walks on one Tuesday and one Thursday each month. Look at our programme for details. Visitors always made welcome! We publish these guides to local walks. Enjoy! 1. Knighton circular walks are here. 2. "Walks you will enjoy"
These 18 walks are offered by the East Radnor Group and have been available from various local centres and by mail for many years, now in its 3rd edition. They are offered here for your enjoyment and are free to download; however, if you would like a full set, pocket sized (approx 200x90mm), on waterproof paper, in a plastic wallet, then please send a cheque for £3 made out to “East Radnor Publications” with request letter with your address to the Group Secretary (see above). GPX files are available on request. Walk 2 - Stowe hill, Cwm wood, Hollowy rocks & Ragged kingdom. Walk 3 - Monaughty, Black hill, Pilleth & Bryn Glas. Walk 4 - Whitton, Upper Litton, Pentre & Cascob. Walk 5 - New Radnor, Mutton dingle, Stanlo tump, Radnor forest & the Whimble. Walk 6 - Llanfihangel-Nant-Melan, Fforest Inn, Water-break-its-neck & Foice farm. Walk 7 - Shobdon arches and hill wood, Uphampton & Covenhope. Walk 8 - Croft Castle, Yatton hill, Croft Ambrey & Bircher common. Walk 9 - Norton, Old Impton Farm & Taylors Wood. Walk 10 - Presteigne, Stapleton Castle, Willey Court & Stocking Wood. Walk 11 - Wigmore, Barnett Wood & Lower Lye. Walk 12 - Lingen. Birtley Cross & Harley's mountain. Walk 13 - Ditcheyeld bridge, Old Burfa, Discoed & Thorn. Walk 14 - Bleddfa, Fishpools, Rhiw Pool & St. Michael's Pool. Walk 15 - Kington, Herrock Hill, Rushock Hill & Bradnor Hill. Walk 16 - Titley, Nash & Little Brampton. Walk 17 - Knighton, Offa's Dyke Path, Panpunton Hill & Holloway Rocks. Walk 18 - Llynheilyn, Foice Farm, Black Yatt, Cwm Kesty & Gwaunceste Hill. Join the Ramblers and become a member of East Radnor Group.